This, believe it or not, is a calling card that is 3 3/4" x 2 1/4". It is made of fairly heavy card stock. It is yellowish-brown and seems to have some staining or discoloration, perhaps due to age. 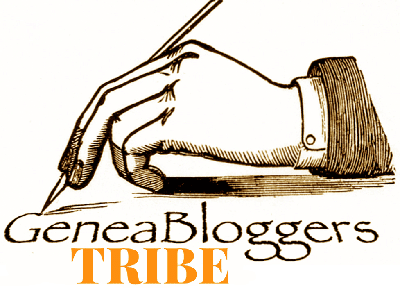 A newspaper clipping has been pasted over printing on the front of the card, and handwritten notes are on the back. N. C. Staff Officer, U. S. M. C., Ret'd. The newspaper clipping is not dated and does not state from which newspaper it came. It probably ran for the first time on August 25, 1920, the date at the bottom of the notice, but these notices often ran for several days. On Jean's calling card, U.S.M.C. is obviously United State Marine Corps, but I don't know what N. C. is an abbreviation for. It does not appear in the Unofficial Unabridged Dictionary for Marines or as anything that makes sense in context in Acronym Finder's list of military and government abbreviations. Can someone enlighten me, please? Because Jean retired twice from the Marines — once before he served as a Vice Consul and again after he re-upped to serve during World War I — this card could date from either time. 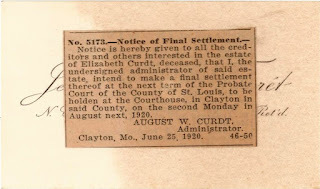 Whichever it is, there's nothing to indicate how old it was when he used it as a notecard for pieces of information relating to settling Elizabeth Curdt's estate. 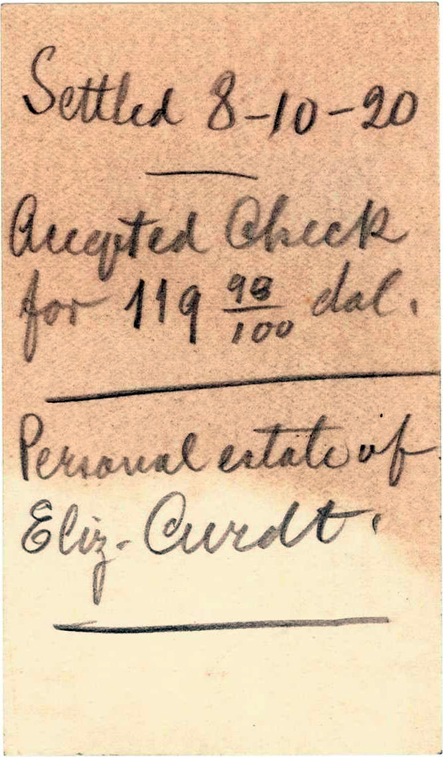 August W. Curdt is listed as the administrator, as he was in Jean's accounting notes. August was Emma (Schafer) La Forêt's half-brother from her mother's second marriage, to Louis Curdt. 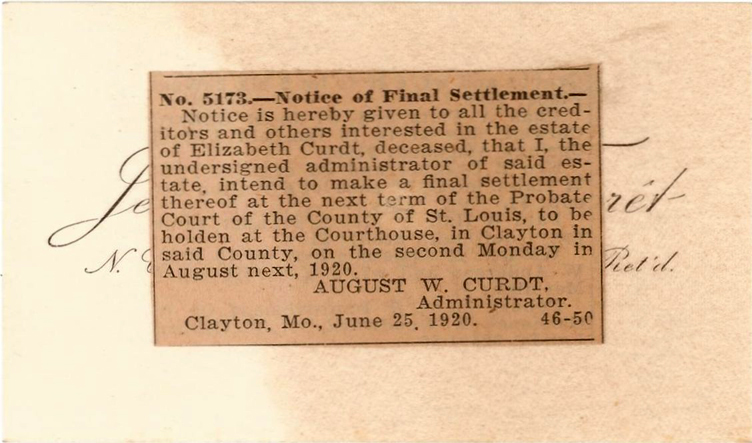 The notice states that the final settlement of the estate was to take place on the second Monday in August 1920. According to Jean's accounting notes and to the notes on the reverse of this card, however, it was settled on August 10, 1920, which apparently was a Tuesday. 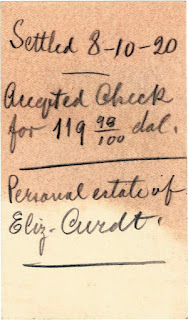 Jean noted the amount of the check accepted, presumably by Emma, as 119.98. I'm pretty sure I have read the letters after the figure correctly — dal. — but I don't understand what that means after the amount of the check. In Jean's accounting notes, he wrote that the check August gave to Emma was $119.94. Somehow I don't think the apparent extra four cents made him very happy, considering that he wrote that he believed Emma was due $133.35. But I don't understand why there are two different figures. Jean has usually appeared very careful in his notes that I've looked at previously, even down to the exact dates of his enlistments. I'm surprised at the differences in the figures in his accounting notes and now in what he noted as the amount of the settlement check. Perhaps they're an indication of Jean's mental state during all of these shenanigans. And in case anyone is wondering why there was no Treasure Chest Thursday post last week, it was not because I was lolling around and taking the night off. We had another heavy storm go through the San Francisco Bay area that evening, and it knocked out my power before 7:00 p.m. I didn't get a text that the power was restored until almost 12:30 a.m. At that point it was already Friday morning, so I decided against a late post. So I'm putting the blame on PG&E!